East Brother Lighthouse, or more accurately a Light Station, is a beautifully restored Victorian Lighthouse Bed and Breakfast Inn perched atop an island in the straits that separate San Francisco and San Pablo Bays. It is operated by a non-profit corporation for the benefit of the public. While only minutes from shore (accessible only by boat) and less than an hour from San Francisco, this historic lighthouse is close enough for a weekend jaunt and yet a world away. Once on the island, visitors take in the spectacular views of the San Francisco skyline, Mount Tamalpais, and the Marin coastline. 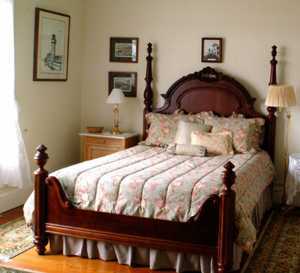 Funds earned by the bed & breakfast, through its non-profit corporation, go toward the upkeep of the island. In addition, the hard work and dedication of many volunteers make the preservation of the 130-year-old Light Station possible. Five rooms are available on East Brother Island. 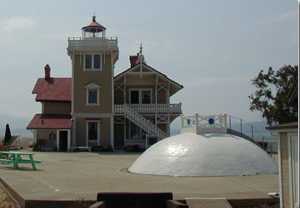 Four are former keeper's quarters located in the historic lighthouse itself. Each room, named for its view, is unique in decor and has a queen-sized bed. A smaller, more rustic room, known as Walter's Quarters, is located in the fog signal building. A gourmet multi-course dinner is one highlight of an evening's stay!